On Sunday 13 April a band of 32 boarded a luxury coach and set off for our annual pilgrimage to Wetherby Races, with the intent of enhancing our financial status. While the weather was somewhat drier than last year the strong wind drove many of us to seek a warmer haven. A feat many achieved by occupying the various refreshment rooms around the course. With eight races to test our equine knowledge and skills, a variety of tactics were employed, such as memorable horse names, favourite colours, well-known jockeys and even form study. Everyone certainly seemed to enjoy themselves even though, as you'd expect, varying degrees of success were reported. So, by the time we all regrouped for the ride home there was a mixture of happy celebration and drowning of sorrows in a local hostelry. On behalf of everyone I'd like to thank Keith Parrot for once again managing all the arrangements in such an efficient manner. 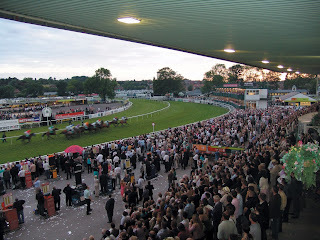 And as for later in the year, we hope to have a second trip, this time to Uttoxeter.